Despite the dynamism of African cities such as Lagos and Cape Town, London where the leading Contemporary African Art fair 1:54 was launched in 2013, remains for now, one of the most important cities within that segment of the art market. This year is off to a flying start with a lineup of exciting African Art exhibitions. They are showcasing the vibrant African art scene along with the wide variety of styles and preoccupations of artists hailing from the continent and its diaspora. Take your diaries out; here are 9 contemporary African art shows not to miss. 1. Ajarb Bernard Ategwa, Hotspot, Jack Bell Gallery. 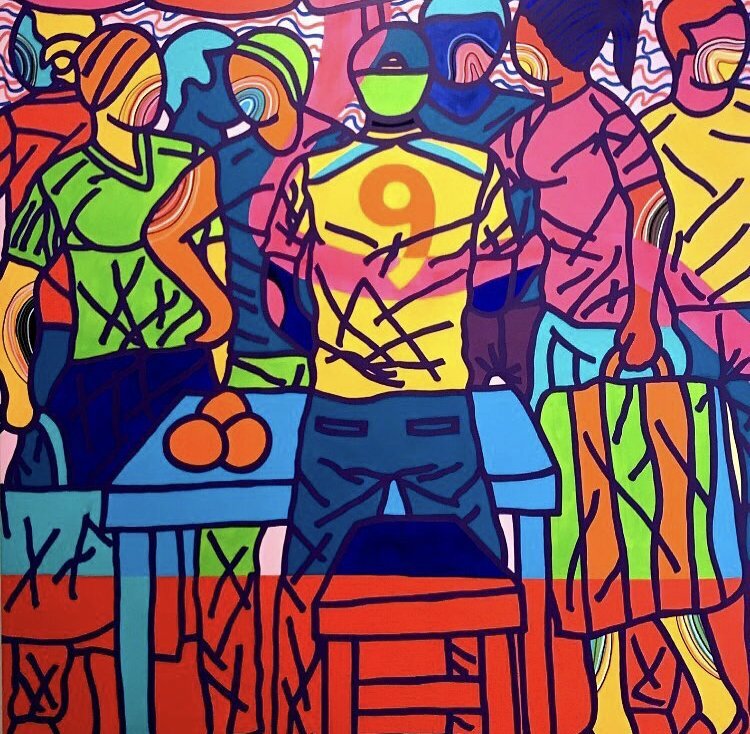 The young Cameroonian artist Ajarb Bernard Ategwa has captured the vibrancy and chaos of his hometown Douala and translated it into a unique visual expression layered on the upper part of his large-scale canvas. He depicts hectic market scenes or daily life by the roadsides. His work reads like a series of snapshots of life in bustling Douala, Cameroon. If you wonder how the bottom of his canvas is constructed, the best way is to check his solo show, ‘Hotspot’ at Jack Bell Gallery, until February 1st. 2. Sethembile Msezane, Speaking through walls, Tyburn Gallery. Sethembile Msezane captured international attention when she embodied a mythological bird that rose and spread her wings as the statue of Cecil Rhodes was being taken down at the University of Cape Town in 2015. Her multi-disciplinary practice challenges official history: the way it has been recorded, the way it is commemorated in public spaces and how it has brushed aside black women. The London art community will have its first introduction to her practice through her solo show “Speaking through walls,” which encompasses “photographic pieces” and “larger installations.” The exhibition is complemented by a series of events including a film screening at The Art Review Bar and a performance and artist’s talk at the New Art Exchange in Nottingham. “Speaking through walls” will open at the Tyburn Gallery from January 25th to April 13th. On the subject of gaps and flaws in official recorded history, Gerald Chukwuma’s first solo show in London will revisit a forgotten tragedy that occurred on the coast of Glynn County, Georgia in 1803, when Igbo captives (from current day Nigeria) committed mass suicide to avoid slavery. Wrinkles will open at Kristin Hjellegjerde Gallery from February 8th to March 23rd. 4. Pamela Phatsimo Sunstrum, Diorama, Tiwani Gallery. The investigation into portraiture, voluntary or coerced, natural or stylised, lie at the heart of South Africa-based artist Pamela Phatsimo’s solo show in London. Her latest body of work emerges from the encounter of two radically different fellows: colonial photography work that defined African people in collective memories, as “the other,” and the work of Chief Solomon Osagie Alonge, a visual record of life in the Royal Court of Benin City (in current day Nigeria). 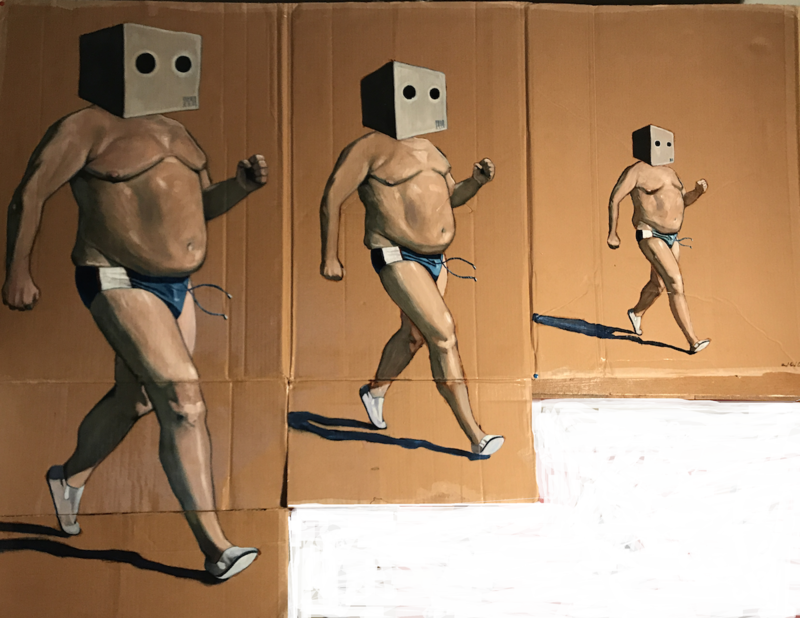 The artist merges elements from these two irreconcilable worlds, to create a series of paintings that raise questions of identity and representation. Diorama, continues at Tiwani Gallery, until March 8th. 5. 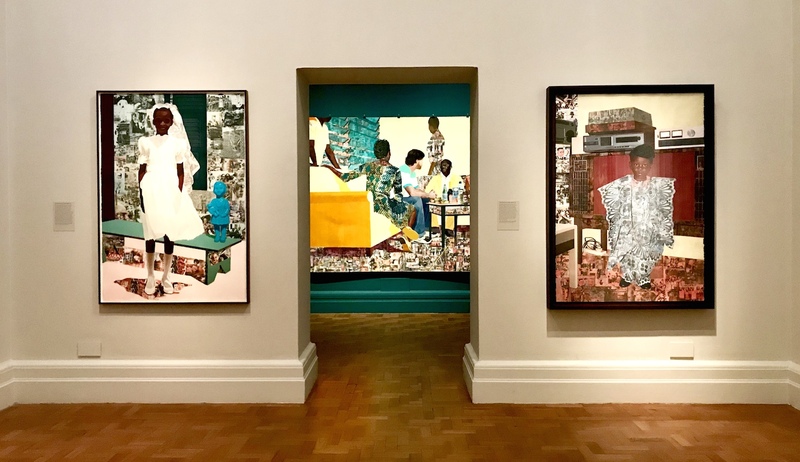 Njideka Akunyili Crosby, The Beautyful Ones, National Portrait Gallery. Since her last solo show in London at the Victoria Miro in 2016, Njideka Akunyili Crosby has become a household name in the Contemporary Art world with her unique style that blends painting, drawing, collage, and transfer. 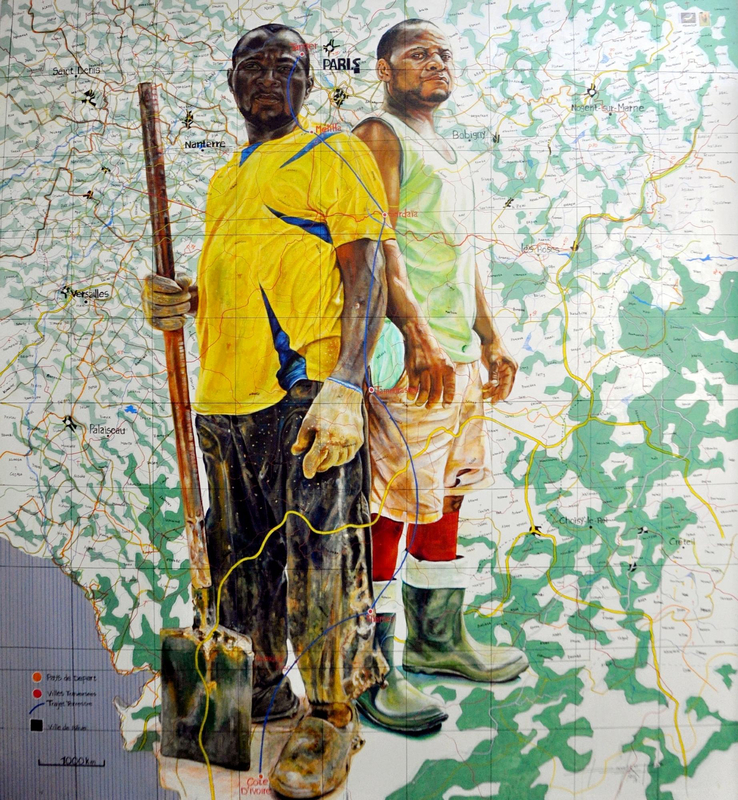 Her mixed technique echoes the hybrid environment she depicts in her work where Nigerian culture is intertwined with elements of western culture. It is the multicultural space she occupies herself as a Nigerian-born artist who now lives in the US. Except for a large-scale painting, Something Split and New (2013), the exhibition comprises exclusively old and new portraits of the series “The Beautyful Ones,” a continuous exploration of contemporary mixed identity through the representation of the artist’s family members and strangers. The Beautyful Ones at the National Portrait Gallery will conclude on February 3rd. At the Autograph ABP, Kenyan born artist Phoebe Boswell shares her deeply personal journey of recovery after two major health scares: partial blindness in one of her eyes, shortly followed by heart issues. Her trauma, captured on video, melds with her emotional tumults, laid bare in charcoal on the walls, which in turn coalesce with the uncertainty of her floating body to create an unflinching meditation on the fragility of life. The Space Between Things continues at Autograph until March 30th . In Disarticulated, the combined work of the artists Jean David Knot and Mohamed Said Chair create a conversation on the economic and dehumanising forces that smother expressions of difference, promote conformism and renders migrants anonymous and their plight invisible. Disarticulated opened on Jan 15th and runs until March 5th at Sulger-Buel Gallery. The same conformism is at play in our visually driven world, with a multitude of images that promote unattainable and unhealthy standards of beauty and perfectionism. Visual Diet is both an exhibition investigating the effect of these enhanced images on our mental health, and a collaborative campaign that calls for alternative visual storytelling. Adelaid Demoah, will perform her new piece “My face” on the launch night. 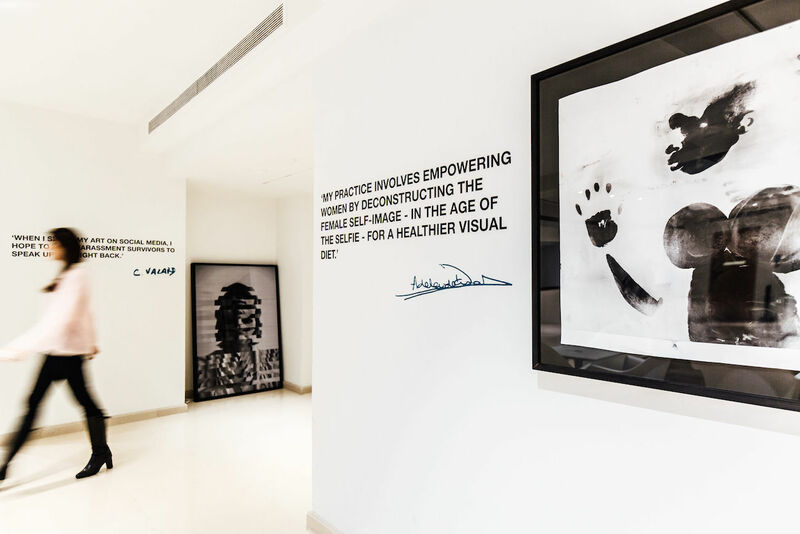 Visual Diet continues until January 31st at M&C Saatchi’s offices on Golden Square. 9. A Decade of Seeing, Daniel Naudé, Everard Read. Even since Daniel Naudé started taking pictures of “stray dogs” in South Africa, animal portraiture has become central to his photographic practice. 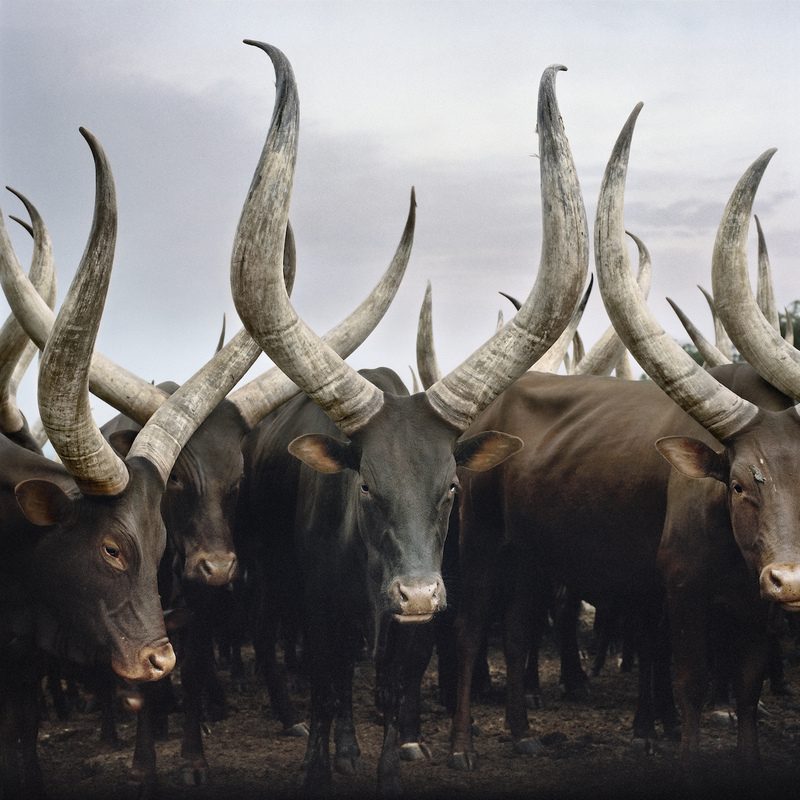 A Decade of Seeing revisits images he has taken of majestic cattle in their natural habitat in various places in Africa (Uganda, Madasgascar) and beyond. His pictures highlight the relationship between animal and human and the critical impact human activity is having on the fast changing Fauna in Africa. Food for thought in this Veganuary month. A Decade of Seeing will open at Everard Read from February 13th to March 2nd.